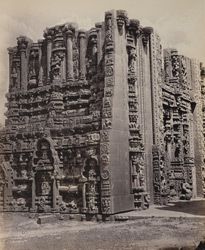 Photograph of the sculptural detail at the base of one of the gopuras at the Ramalingeshvara temple at Tadpatri, Andhra Pradesh from the 'Photographs to Illustrate the Ancient Architecture of Southern India' collection, taken by Edmund David Lyon in c. 1868. The Ramalingeshvara temple is situated on the right bank of the River Penner. It was built in the early 16th century during the Vijayanagara period. The temple is surrounded by an enclosure wall entered through large gateways or gopuras on the south, west and north sides. Although unfinished these gopuras are covered with elaborate carvings consisting of architectural elements, such as niches covered by miniature temple towers and pilasters standing in pots. There are also sculptures representing figures of divinities, donors, maidens and rearing animals with riders as well as friezes, scrollwork, miniature animals and birds. The complex consists of two temples opening on a common hall.